The school board took action on March 27, 2019 to retain the Educational School District 123 as the professional search consultant to seek Mr. Payne’s replacement. As part of this process, the ESD 123 along with the CPPS Board of Directors is gathering data on the qualifications and characteristics for the next College Place Public School District Superintendent. 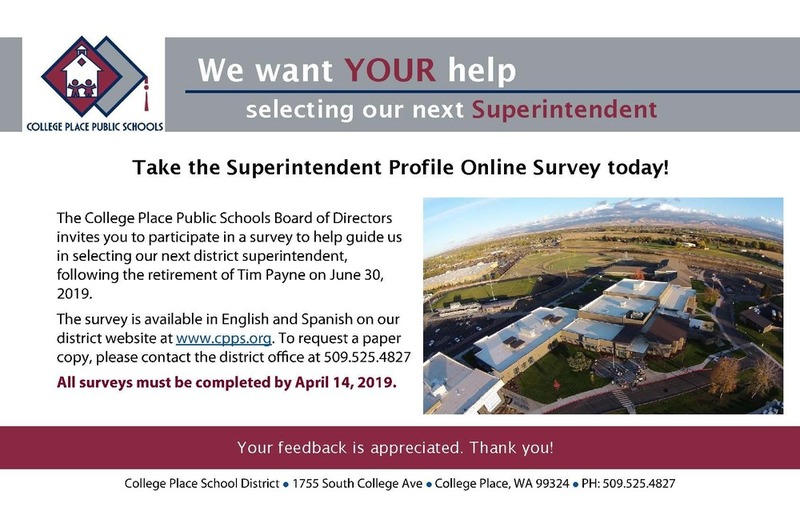 Please take a moment to fill out the following survey by April 14, 2019. The Board of Directors deeply values your input and guidance, and strongly recommends that you take advantage of this opportunity. Also, please encourage parents and other community members to participate in this survey. Hard copies of the survey are available at the District office.